When Will the Trump Administration Finally Confront the CIC? I have advocated independent review of climate science by the Trump Administration over the last few years, most recently here. The best way to do this is a formal reevaluation and rejection of the Greenhouse Gas Endangerment Finding (EF) issued by the Obama US Environmental Protection Agency in 2009. This might lead to real action–rejection of the EF. The Trump Administration has scaled back EPA’s climate-related regulations, but been careful not to formally reevaluate EF or attack climate alarmist “science.” Until the EF is formally reevaluated and rejected, EPA is in legal jeopardy of being forced to implement various attempts to reduce greenhouse gas emissions despite its dubious benefits. 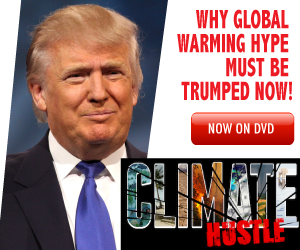 There have been various attempts to carry out reviews that might question climate alarmism, but no serious review has been undertaken to date by the Trump Administration. This week a new effort has been rumored to be undertaken on a portion of climate alarmismt science, namely the impact of alleged climate change on national security.This would be in the form of a review by a Presidential panel or committee. Only one definite member of the panel has been mentioned, Dr. William Happer, who was rumored to be the chairman. The CIC immediately howled bloody murder against Dr. Happer, despite his long and distinguished service in the academic and governmental worlds. This attack was presumably in hopes of derailing the effort even though there is no information as to who the other panel members might be. The Climate-Industrial Complex (CIC) prepared their usual attacks using logical fallacies, particularly their trademark ad hominem attacks, this time against Dr. Happer. They claimed that climate alarmism was “established science.” They claimed that Dr. Happer had compromised his objectivity by various statements that indicated that he was a “denialist” since he does not subscribe to many of the beliefs advocated by the UN IPCC reports. They claimed that Dr. Happer is unqualified since he had not completed course work in climate science (which probably did not exist at the time he completed his PhD). Imagine, he even believes that carbon dioxide is not a pollutant but rather a vital constituent of the atmosphere that makes life on Earth possible. Horrors! Whether the rumored proposed panel will survive such a major attack by the CIC remains to be seen. To date, the Trump Administration has retreated or ignored all such climate science review proposals. Will the Trump Administration retreat as usual in face of this attack from the CICs “captive” main street media? Or will they make a serious effort to undertake a review and new policy statement at least in this part of the climate policy science space? If so, the CICs usual operating approach of using logical fallacies through their “captive” media can notch another “victory” and encourage similar CIC bad behavior in the future. The Trump Administration has less than two years left to launch a serious, public, scientific review of the climate scam. There is barely enough time to finish such a review before they may leave office in 2021. If they should win a second term in 2020, would they undertake such a review in their possible second term? Until the EF is scrapped, the US is in danger of wasting still more trillions of scarce dollars on the world’s biggest scientific scam.